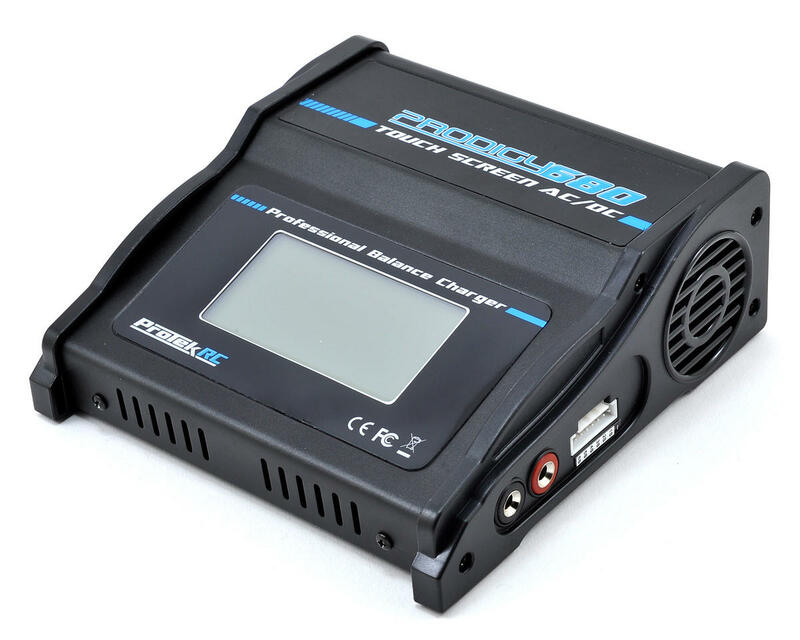 This is the ProTek R/C "Prodigy Touch 680 AC" LiPo/LiFe/NiMH AC/DC Battery Charger. The next generation of Prodigy has arrived. The Prodigy Touch 680 AC features an intuitive touch screen user interface that is incredibly easy to navigate. 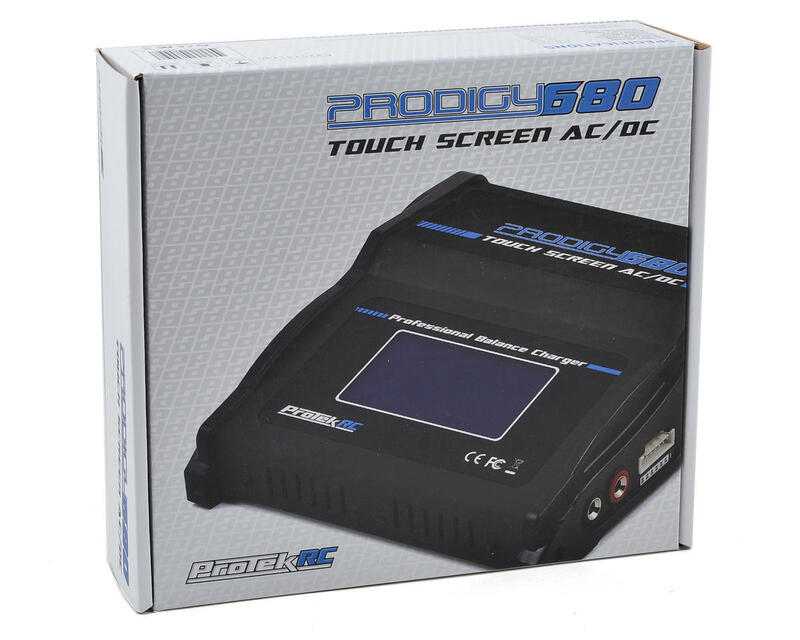 With no buttons to wear out, an 80 Watt internal power supply, charge rates up to 8 Amps, and the ability to charge batteries up to 6S, the Prodigy Touch 680 AC is a great choice for both surface and air enthusiasts. Plus, its backed by the unmatched customer support you receive from ProTek R/C, so buy with confidence knowing we've got you covered! The Touch 680 AC also provides important information during the charging process, including a data graph, internal resistance of the battery and individual cell voltage. Additional features include adjustable per-cell end voltage, worldwide voltage compatibility, automatic cell count recognition, and a Digital Power setting that allows you to power additional DC powered equipment when you aren't charging a battery. These features only scratch the surface of what the Prodigy Touch 680 AC delivers. Grab a Prodigy Touch 680 AC and see for yourself why Protek R/C is found on the benches of some of the most respected R/C professionals in the world, including racer Atsushi Hara, pilot Tim Jones and more. The next generation has arrived. Don't get left behind. NOTE: To determine if this charger is suitable for your application, you must perform this calculation to determine the maximum amp rate the charger can supply. Divide the Watts of the charger by the Voltage of the battery pack. This will tell you the maximum amp rate the charger can deliver (Watts / Voltage = Amps). So using the Touch 680 AC as an example and a 6S LiPo battery pack, would be 80 Watts divided by 22.2 Volts, which equals 3.6 Amps. This means that the charger can supply a maximum of 3.6 amps to a 22.2 Volt 6S battery. This amp rate will gradually reduce as the battery voltage increases during the charge cycle. Purchased this balance charger for the 80watts power, the touch screen and the ability to read internal resistance. Overall it is a good charger, easy to navigate, bright screen and nice size and appearence. It is weird that although in the manual states that the storage voltage for the LiPo batteries is 3,85 volts (like all other chargers), it is set at 3,90 volts and it doesn't let me set it any lower. It only goes up (way up, over 4,20 volts), but no lower than 3,90 volts. I don't know why, but it is defenatly something that needs to be looked, unless i do something wrong. Also the internal resistance numbers vary from one messurement to another messurment even if you do it multiple times one right after the other. I guess, it is there to give just an indication approximetly of the resistance. I don't know how this feature works on other chargers, this is the first one of mine to measure internal resistance. Still nice thing to know the condition of the battery. I had no RC experience and only started to play since 2014, this charger is my first one, so I can't tell you the comparison with others. But this charger is good for me, I didn't know how to start to charger until I found out I had to press for 5 seconds to see the start button. This thing is light for me to carry around, price is not to bad, so I think for newbie this is not bad. This charger is great, love that it has 80w, can charge my 2s 4500 mah lipos in about 30min at 2c rate. My only gripe with this charger is that it only has memory for 1 battery, so if you have multiple packs of different Mah and cell counts, then you would have to manually enter those specs every time you charge a different batter pack. Other than that its an awesome charger, really loving the Protek brand, My lipos, servos and now my charger are all protek and haven't had any issues. This is a great little charger for the money. The touch screen and interface is really easy to navigate and set up. The included balance board is a little short, but you get lots of different charge leads for just about any type of battery you wish to charge. The size is really nice as well. It is compact and does not take up a lot of space on my pit table. I use mine to charge my starter box and RX lipos for nitro and it works great doing that. If you are looking for a great charger at a low price and you don't need to charge multiple batteries at once, this is just awesome. 5/5 Love it!!!! Just got it a few days ago..... it's smaller than I imagined. But it's very cool!! I like it alot though. It's quiet and very easy to understand. I'm still stuck in the NimH age but at least now I can start updating my batteries. Charger is still a great value.... however... the main battery charge lead WILL fall apart on you. It's a cheap Chinese product with TINY 22ga wires that barely hang on to the Deans plug. I get it. Keep costs down.... but this is the main power going to the battery. After re-soldering the Deans plug back on three times, I had enough and took it completely apart. I saved the banana plugs and the Deans plug then used Deans Wet Noodle 12ga copper wire between. Now it's 100x stronger and I feel confident that it can carry the amperage load. This is the only fault I've found in the package. Everything else (so far) has held up. Best charger for the money, easy to use and program, very intuitive menus, can't go wrong with this one! I've had my charger for some for 3 years and this has been a great charger. Very easy to use, with a small footprint for my pit space at the track. It doesn't charger as fast as the ichargers but I found that they are overkill for most racers. It comes with the stylist but I've had no need for it. It works great with just my big fingers (size13 work gloves). The options for charging are easy to use and I would recommend this charger for any racer or basher. This is a great charger touch screen is awesome and the menu is easy to navigate through. Great charger for the price. I had a few unbalanced batteries and with this charger they are all back to 100% working order. Stays around 75-80 degrees constantly. I've had this thing going for 3 hours or so with no hot temps. Always remember your LiPo bag! Great charger for the money. Very easy to use and the backlit display makes everything very easy to read. It comes with a stylus which is a plus but I use my fingers which works just as well. Also included is charger leads for various plugs which is really great to have around if you have batteries with different style connectors. All this backed up by A Main's great service and you really can't go wrong. I wish there was a switch to turn the unit on and off instead of unplugging/replugging the power cable but this is me just nit picking. I fly helicopters now, so this was the perfect charger for me. Back when I was racing R/C cars, I would have purchased the Duo or even Quad charger. Great charger. Very well suited for someone who is starting out in the hobby, or for someone who is running one class at the track. Touch screen is intuitive and easy to use. This was my first "professional" quality charger. Up until now I had always used the charges included with the various craft I've purchased. I didn't know what I was missing! The various modes allow me to do just about anything I'd like (e.g. fully charge, charge for storage, discharge, etc.) and the on-screen controls are very intuitive. My only complaint (and a *very* minor one) is that it didn't come with a charge cable with an EC3 connector. I bought one from my LHS for $6, but it would have been nice to get one with the charger. All in all, this was an excellent addition to my tool chest. I have owned this charger for a little less than a month and so I have only used it about 6-7 times so far. This was my first experience with LiPo batteries and I was a little nervous about it. Previously I only had experience with the old NiMH style battery packs. After some searching on the web and YouTube I was able to figure out what settings were required to properly charge my pack - Reaction HD 11.1V 5000mAh 50C 3S LiPo, Battery, Hardcase: EC5. The instruction manual is not the greatest but I am a novice in the RC world and need the step-by-step. Maybe other users would know what settings were required without searching the web. The unit itself was smaller and more compact than I imagined it would be which is nice. The touch screen is precise and I like using the supplied pen/stylus that came with the unit. The unit itself runs pretty quiet and it charges my LiPo pack in about 50 mins I believe. It did not run hot. The charger came with several connectors but as my luck would have it did NOT include the EC5 I needed for my LiPo. 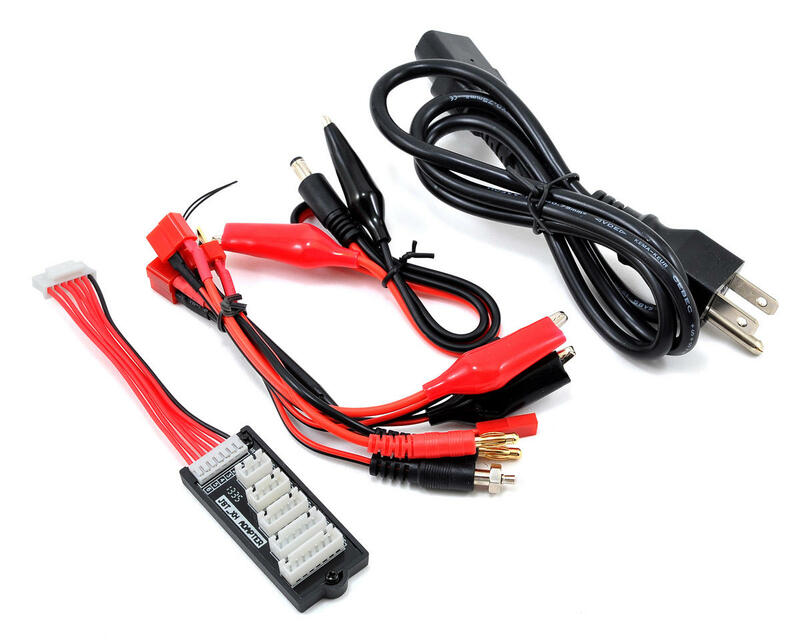 The ProTek EC5 charge lead is available on Amain for $5.99 but was on back order so I had to resort to Amazon and pay a bit more at $8.90 for the UAV 2 PCS EC5 Connector Male to 4mm Bullet Banana Plugs 12AWG Lead Adapter Cable for RC Battery Charger. Overall I am happy with my purchase of this charger and would highly recommend it. Amazing power and features for a super small lipo charger. Perfect for the weekend club racer or backyard basher. Great charger, plenty of power for parallel charging UMX batteries with the Protek 2 cell 12 battery and the 1 cell 12 battery boards. The internal resistance meter is cool and you can monitor individual cell voltages. I use this to charge my gens ace 2s 5000mah batteries and it does an amazing job! I'm getting almost 40 minutes per battery. It needs an ON/OFF switch....dumbest thing I've ever seen NOT having an ON/OFF switch..forces you to plug IN/OUT each time. this product is very easy to use and practical, easy to understand and versatile. only thing is when you charge a brand new battery, don't use the auto option, as it won't fully charge the battery. Other than that I would recommend it to anyone!